You are hitting your targets and closing more deals than ever but for a winning sales team, this is just not enough. It’s also important to consistently monitor sales performance so that you can spot issues, improve processes, and always keep your sales strategy and goals aligned. To be able to do this, you will need to analyze your team communications and see what high performing team members are doing differently and why some team members need additional support and training. Part 2 explores some more ways in which businesses can combat the slow start and early finish to the week. Last week, we looked at how to track and analyze activities and select pre-defined activities for Monday morning and Friday afternoon, which can get all team members involved and help to revitalize low energy periods. Today, we look at how to keep the team motivated by setting goals and how to use rewards and treats to recognize the hard work that they put in during periods of ‘slump’. A study by Accountemps has shown that Tuesday is the most productive day of the week. It also highlights that Monday morning and Friday afternoon tend to be the least productive with only 3% respondents agreeing that Fridays were the most productive days in their offices. As Head of Sales at SYNETY, this has also been my observation – an otherwise great week’s work from the team is usually marred by Monday morning and Friday afternoon blues. We believe that every business, to some degree, falls foul of these low energy periods. Do you use a CRM system to manage information related to customers and prospects? 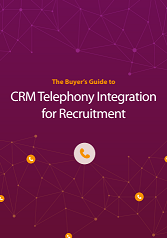 Does your sales team use the phone extensively to connect to prospects while storing data in CRM? Is your customer services team optimised to handle a large amount of inbound calls? If you answered yes to at least two of those questions, it may be time to consider a switch from a traditional business phone system (PBX) to computer telephony integration (CTI).